Is Apple’s watch Series 4 for You? Apple recently released its all new Apple watch series 4. Just by looking at it you wouldn’t straight off see any major changes but once you power it up you’ll realise that Apple has come a long way with its watch series. The same shape, same design and same bands, on the looks side, Apple watch series 4 is your same Apple watch. However as soon as you turn it on you just know that the Apple watch series 4 is not like its predecessors in some ways. What’s New in the Apple Watch Series 4? Due to its curved display and no bezels, the Apple watch series 4 seems to have a 30% larger screen which you notice as soon as you power up the thing. But that’s not all that is new with the new Apple watch series 4. The new Apple watch series 4 comes with a crown that provides haptic feedback as you scroll through the screen, a much louder speaker (don’t know when anybody is going to need that), a much faster processor and an all and new wireless chip all snuggled up into one sleek body. If this still does not impress you then let me tell you the Apple watch series 4 also comes with a heart rate monitor and an ECG scan. The heart rate monitor thing may not be super interesting as all sport watches come with anyway but having an ECG in the watch is a start. Having all these things in the Apple watch series 4 is not going to come cheap for anyone. You can get the basic model with GPS for $399 and the cellular model with a 40mm case or a 44mm case for $499. But this shouldn’t be surprising as Apple is hardly known as an affordable brand. What’s makes this Apple watch series 4 all the more special is the combination of updated software and hardware. The new health features added to the watch also makes it a winner in anyone’s eyes. The Apple watch series 4 comes with new sensors that monitor not only your heart in the ECG readings but also notifies 911 when the user takes a tumble and does not get up for a minute. To know more- Apple has updated the gyroscope and accelerometer to identify when a person has fallen and needs emergency services to be phoned up. Heart Screening not yet there…. The Apple watch series 4’s heart screening features are at present are a no show and will come later this year along with an update. 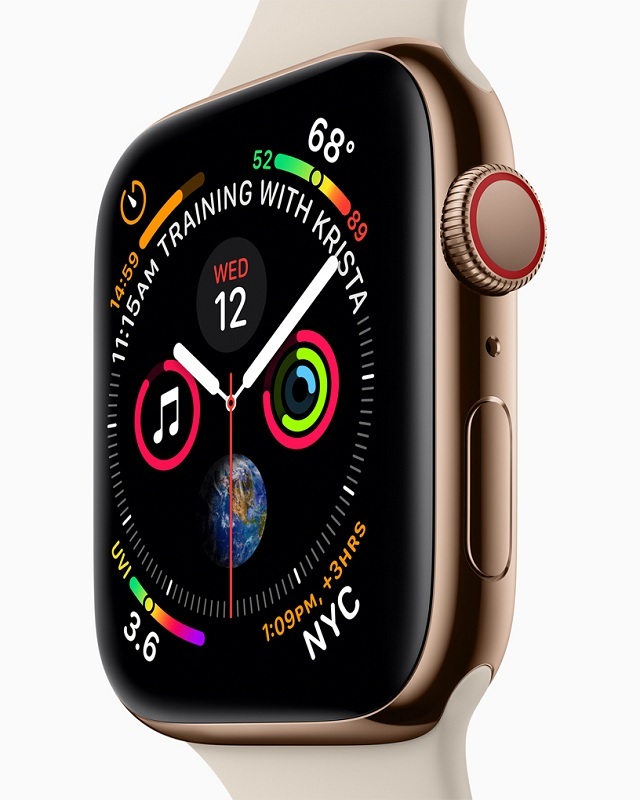 The heart screening tech keeps track of your heart rate throughout the day and the Apple watch series 4 also has electrodes in the crown and crystal back to record an ECG. If the Apple watch series 4 gets an atrial fibrillation in its reading it will confirm it four more times and then send the user an alert. Apple Event: Go Big or Go Home! What is a 5G network mobile network?